RAPUNZEL & PIE : Need a little time to rest your mind? Need a little time to rest your mind? Okay…SO WE HAVE A BLOG!. Let's give it up for Rapunzel and Pie! As this is our very first entry (which will be, with no doubt, something very valuable and precious when we will be famous and rich) we feel like it should be extremely witty/cool/great/awesome. But, however, there is a reasonable doubt it will be not. I have once said, that I will never ever have a blog because it’s pathetic to whine about your problems on the internet and hope that somehow someone will accidentally find your blog and say “oh, this is exactly what I was thinking!” and then suddenly you will be famous and have tons of friends. BUT, as I met my best friend Pie, we got weird, and no one except my darling Pie seemed to share our enthusiasm for pretty clothes, European movies, indie-electro-pop music, lomography, Indian English and other stuffs that we like. So we figured that a good way to get us out there is to start writing this here. Our blog. SO WATCH OUT YOU BASTARDS! Rapunzel and Pie coming through. My favourite twins! 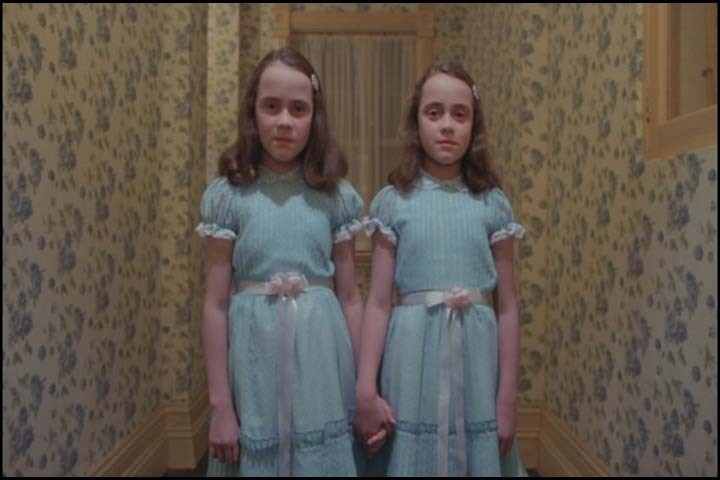 From Kubrick's The Shining. Which was the first movie me and Rapunzel have watched together. Oh we were young back then. And scared. And from an unexplained reason we drank vodka and juice. And then we were sick. But we are not evil. Nor creepy. We are two lovely ladies from the back row of the classroom. And we rarely give anyone a reason not to like us (we dont, for example, dress in matching little blue dresses and stand in the hallway while holding hands and staring all creepy into people. Although now that I've said it, it sounds quite a good idea).